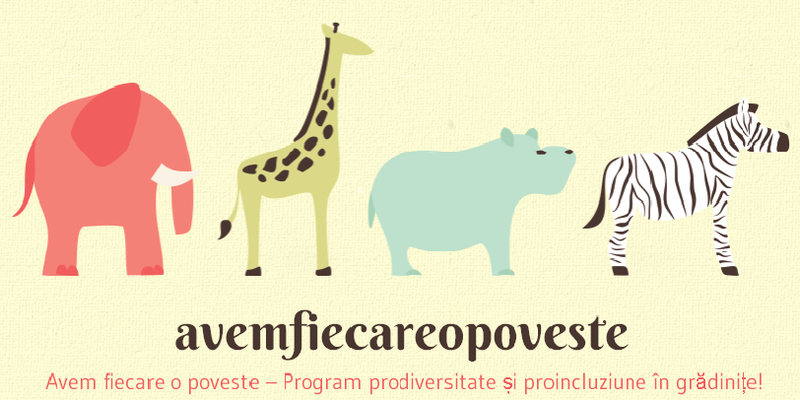 The project „We all have a story”, financed by the NGO Fund (Norway, Lichtenstein and Iceland funding mechanism for Romania) is developing a new methodology for addressing pro-diversity education in early childhood settings. The project is a partnership between AMURTEL Romania, sharing expertise in the inclusion of children with disabilities, Romanobutiq, sharing expertise in inclusion of Roma children and the Center for Equal Partnerships (CPE), sharing expertise in educating gender equality. It first aims to help teachers establish human connections and respect for people from different minorities – including ethnic minorities and people with disabiities as well as addressing gender based stereotyping and oppression. By creating a safe space for sharing personal stories, all of the participants will have the opportunity to appreciate the differences and similarities between their own stories and those of people facing the extra challenges of being in a minority. Stereotypes and prejudices are formed in early childhood. Once formed they become resistant to change and create a basis for racism, sexism, homophobia, etc. Translated into action – they lead to inequality, discrimination and social violence – from limiting human rights to extremism, hate speech and hate crimes. Early intervention while the child is still in the formative stage is critical, and increases the likelihood that they will become balanced adults that respect diversity and the fundamental rights of other human beings. Between September 2014 and March 2015, 100 teachers will be trained in anti-bias education and 3 practical methodolgies: Persona dolls, Life-stories and Sand-play. In the period of March – June 2015 we will be supporting 25 of the kindergartens in implementing thematic projects about diversity and we will pilot a complex pro-diversity educational program in 6 kindergartens.